There's nothing like jumping on a plane and heading to a new land. There are new sights, sounds, customs and tastes to explore. If, however, your time, money or even courage are limited, all you need to do is travel to Qaderi Sweetz 'n Spicez Market on Redwood Road or State Street for an international experience. 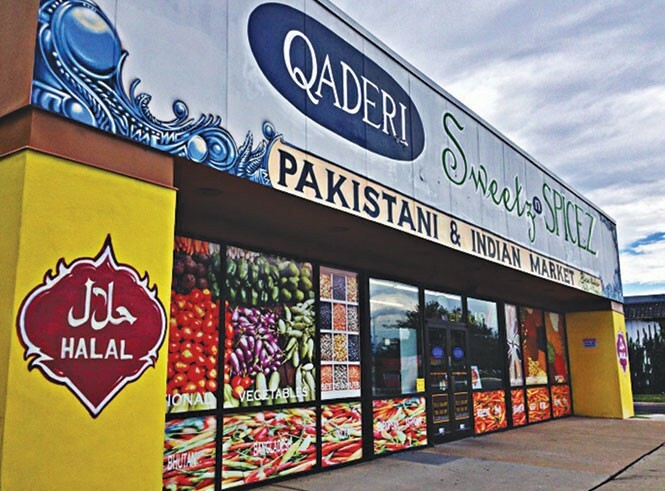 Qaderi is a family business, launched 20 years ago at the Redwood Road location, and carries foods from 25 nations to satisfy your appetite and curiosity. You'll find a huge array of oils, sauces, rice, flours, breads, teas, chutneys, relishes and veggies, plus a vast spice collection. If you're accustomed to chain grocery stores' "international" sections, which take up only a few feet of shelf space, your mind will be blown. I saw rice and flours I'd never heard of, in quantities that belong in food storage. There were veggies called chikoo, karela, methi and chana. I don't know what they are, either, but if they're in Qaderi's dishes, I know they're good. The Redwood Road location—and soon the State Street store, too—has a restaurant inside that serves chicken biryani, bhindi masala, aloo gobi, kababs and kormas, among many other dishes. All come with fresh naan, basmati rice and a drink. The distance from Salt Lake City to Mumbai, India, is 7,618 miles. That's a long way to go, but the journey to State Street or Redwood Road isn't. And a trip to either location might awaken an adventurous spirit you didn't know you had.